This solo task is the fifth in a series of six. 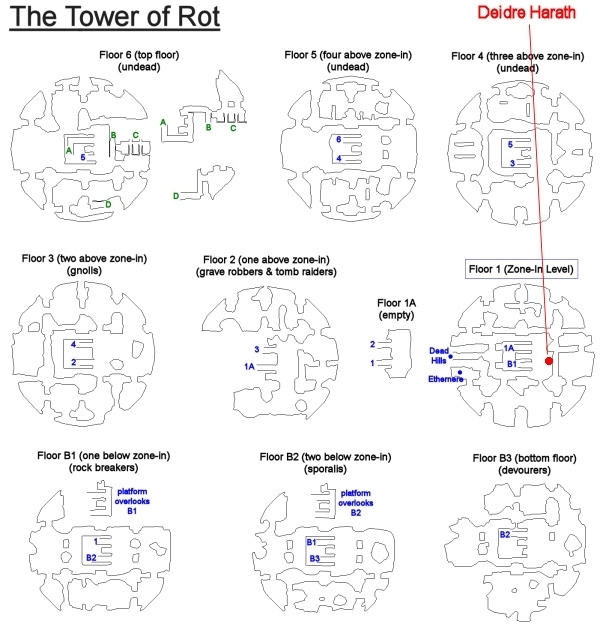 It begins with Deidre Harath (click for map image) on the zone-in level of the Tower of Rot. Say "prevent" to request the task. Deidre Harath smashes a fist into her hand. '_____, this is not going as well as I had hoped! You have done well, though; don't mistake my anger. It's Adana with whom I am angry. While you attempted to descry Narius' plan, Adana swept through here with a band of Scions and stirred up [mayhem]. You have been assigned the task 'The Adana Problem'. Adana Baxter and a Scion raiding party have attacked Deidre's position and destroyed some of Quincy's supplies. Now you must retaliate and ensure this doesn't happen again. - Hail Quincy to receive "Quincy's Bloodstone Detector". - Right-click the "Quincy's Bloodstone Detector" to receive directional emotes to an update location. --- Tells you above or below; direction (north, west, etc. ); and how many paces away. - Step over the update location (may be fixed or random - not confirmed) to trigger ambush spawns. --- 2x "a bubonian thrall" auto-aggro spawns (staggered, separated by about 60 seconds). --- 4x "a Scion harrier" auto-aggro spawns (staggered in waves of two, separated by 105 seconds). --- 4x "a Scion thrasher" auto-aggro spawns (staggered in waves of two, separated by 150 seconds). --- Once thrashers are dead, you have another set to deal with: 4x "a Scion deathmask" (has same spawning mechanism). - Hail "an injured Scion". - Move down one floor and spawn Lieutenant Caridi in the western room of the floor. - Say "Adana" to him to make him aggro; then kill him. 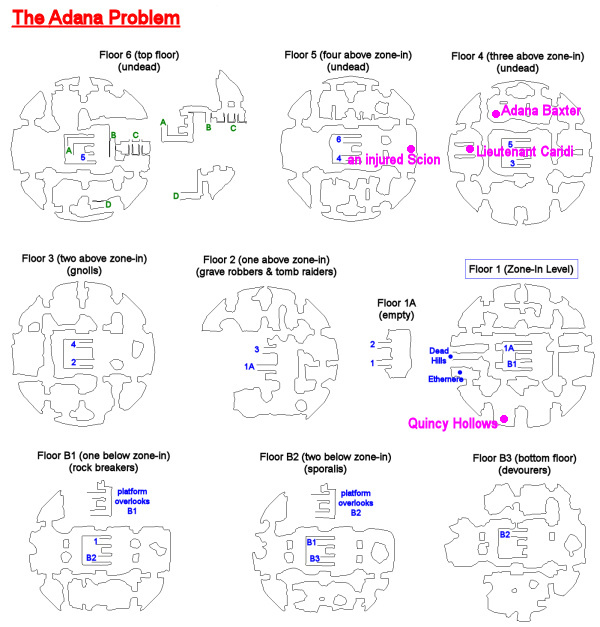 - Head to the northern room of this same floor to spawn Adana Baxter. - Say "ploy" to make her aggro; DPS her to low health for the update. - Hail Quincy, then deliver 3x "Pile of Rot" to him. Task Window Says: Speak with Quincy Hollows and find out what happened when the Scions attacked. You receive "Quincy's Bloodstone Detector". This item, when right-clicked, tells you where to go to get the next seven updates (will tell you to go above, below, or somewhere on your level; a direction; and how far away a location update is). Task Window Says: Use Quincy's Bloodstone Detector to follow the trail of Scion blood and find out where the raiding party went. Deal with any threats you discover. You detect a concentration of blood above your location, to the east, at approximately 123 paces away. You feel the presence of Scion raiders. Soon after this emote (30 seconds or so), 1x "a bubonian thrall" spawns and attacks (auto-aggro). 60 seconds later, another one spawns. The thralls hit for a max ~13,000. Note: Update locations may also be visually indicated by a trail of blood drops on the ground. It's not known for sure whether the ambush update locations are fixed (the same locations every time), or if they're randomized. Task Window Says: Continue using Quincy's Bloodstone Detector to follow the Scion trail. Deal with any threats you discover. Same as above, except you get 2x "a Scion harrier" at a time (waves separated by 105 seconds), for four total. These hit for a max ~14,000. Task Window Says: Quincy's Bloodstone Detector indicates the blood trail climbs still higher into the tower. Be prepared to face any Scion threats that you find. Same as above two encounters, except you get 2x "a Scion thrasher", followed by 2x "a Scion thrasher" 2.5 minutes later. Once the thrashers are dead, another set of mobs will spawn: 2x "a Scion deathmask" followed by 2x "a Scion deathmask" (waves separated by 2.5 minutes). Each of these mobs hit for a max ~14,000. The injured Scion's blade has punctured your side and injected poison into your veins. You feel weakness spreading through your body. You become poisoned with "Mild Bone Rot" (limits hitpoints to 80%), which you'll have to deal with for now. Task Window Says: You have been poisoned by the injured Scion. You must consume Piles of Rot from the ground in order to prevent the poison from killing you. Before the Scion died, she mentioned that Lieutenant Caridi had gone to the floor below. Seek him out and confront him. Optional: You can temporarily cure the poison buff on you by using one of the green ground spawns ("Pile of Rot") scattered around the floor. This stops the effects for 35-40 seconds. You sense Lieutenant Caridi is nearby. Lieutenant Caridi laughs and shoulders his club. 'Walked right into it, didn't ya? Feel it hot in yer belly, like a slug of drink? That's the rot, and yer done for! There'll be nothin' left for [Adana] to kill. She'll be so sad! After a short delay, he goes aggro. He hits for a max ~17,500; has ~8.5 million hitpoints; and casts "Club to the Head" on random targets (nuke for 40,000 dmg + spinstun). Lieutenant Caridi has been slain by _____! Task Window Says: The poison within you is intensifying. You must confront Adana Baxter on the floor where you fought Caridi if you wish to learn the truth. While on this portion of the task, you are inflicted with "Moderate Bone Rot" (limits hitpoints to 70%). Again, this can be temporarily (optionally) cured by using the "Pile of Rot" items (green ground spawns) scattered throughout the floor. You hear Adana laughing nearby. As you approach Adana, the rot intensifies and seeps into your bones. You feel yourself rotting from the inside out. Adana Baxter smiles at you. 'Why, is that my old friend, _____? So wonderful to see you! And are you well? Oh, my, you don't look so well! Are you ill? Have you eaten something foul? Or did one of my little drones sting you? You really are too [trusting], always believing whatever apparent truth is thrust in front of you! Ater a short delay, she goes aggro. She has ~8.5 million hitpoints; and casts "Break Brittle Bones" on random targets (nuke for 46,000 dmg). DPS her to 10% for the update. Adana Baxter steps back, laughing. 'Quite tenacious! But don't start thinking I'll regret choosing Narius over you. A tenacious fool is still a fool, and an honorable corpse is still dead. I don't have time to trifle further with the doomed; Narius is about to enter the source of rot, so I must be off. Enjoy your last few minutes before the rot consumes you!' Adana Baxter disappears into the shadows. Task Window Says: Tell Quincy Hollows what has happened. Perhaps he can make a cure for you using several Piles of Rot. Remove any "Pile of Rot" items from your inventory, and hail Quincy Hollows. You'll need to bring him 3x "Pile of Rot" (if you had some on you, they don't count) and hail him again. Quincy Hollows takes three piles of rot from you and drops them into an elixir. As the concoction bubbles and smokes, you drink it down and feel strength creeping back into your body. 'You're looking better already! I think the worst of the malady has passed, but I would take it easy. Oh, I hope those horrible raiders don't return with poisoned blades for the lot of us! How will I ever have enough elixirs? Task Window Says: Quincy has cured you. Tell Deidre Harath all that has passed. You have killed Adana Baxter's raiding party, although Adana herself escaped. Now she and Narius are about to enter the source of rot. 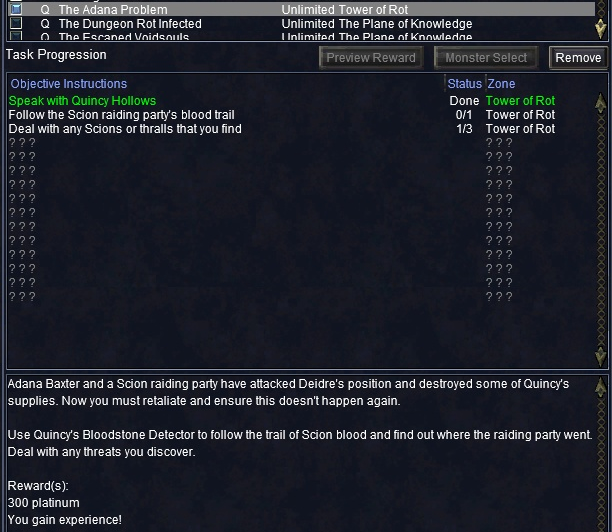 The third step of the task should now read "Deal with any Scions or thralls you find 0/3 (Tower of Rot)"
Also discovered that spawning the mobs and killing for one toon gets the whole group credit(if on the same step), therefore saving the time of having to kill mobs for each toon to update. Just don't send any additional toons to the spawn point, or you get the chain of mobs at the prescribed intervals for all toons that touched the trigger spot. Challenging even at 105 but doable, even boxing. I found we were able to set up the group at the first landing of the stairs and then send one toon to the trigger spot for the mobs and they'd agro the group, not the single triggering toon. Strange but a nice feature that saves having to clear and keep cleared the entire room where the trigger spot is found. The mobs hit hard and fast and are highly resistant to mez so fighting multiples has its challenges. Steps that appear to require every one in the group to do invidually, like Hailing an NPC, do NOT. The first person hailing gets the whole group credit but the task itself may not be "checked off" until a subsequent step is completed, such as killing said hailed mob. The final two fights aren't hard, you just want to clear around a bit to avoid surprises. We just ignored the rot debuff which just lowers HPs by a certain amount. One person can collect all the Piles of Rot and hand then out as needed at the end. Scion harrier runs out of the room and brings back 3 adds. Completely group geared only with one group and you can expect a long fight with respawning of the mobs once cleared. This zone is completely bugged. Some spells, even group buffs aggroing on some places 10+ Skets, Even buffs like Galvons Retort is dangerous. It seems if you are at a place with mobs directly above and under another floor the most spells aggro these mobs. What a mess. Years ago EQ was know as Everbugged - it seems with this Tier2-Expansion the name is again full program! If there is a nice start for Adana which dont include Raid Tanks and Raid Healers - I would appreciate some advice. At the present, all members of the group get discover updates and updates on the spawns while following the blood trail. It also appears that the second set of spawns are no longer timed and must be triggered a second time, at least as far as the second update step along the blood trail is concerned. Edit: This remains true through both the four-spawns. Once you locate the blood spot (little red ground spawns) that triggers the ambush mobs, move away from that point and the mobs do not continue to spawn on a timer. Kill the mobs that spawned, move back to spawn the next set, pull back away from trigger location. You can rinse and repeat until you are done.